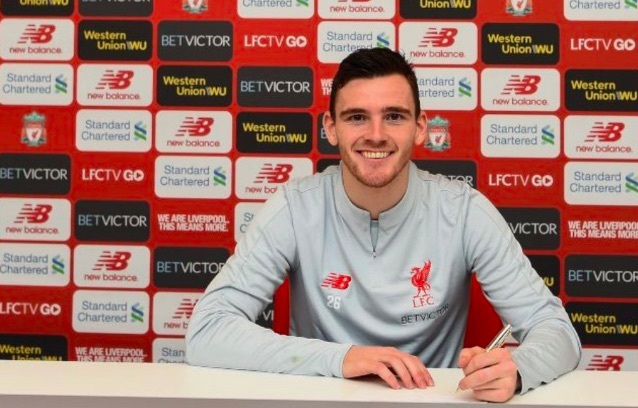 Liverpool signing Andy Robertson for roughly the same money we allowed Kevin Stewart to join Hull the other way is one of the best bits of business anybody in the Premier League has done in recent memory. Since the Scot won a spot in the team ahead of Alberto Moreno, he hasn’t looked back, or barely put a foot wrong, in fact. This season, he’s established himself as the best left-back in the top flight by an absolute country mile – and is realistically up there with anything in Europe. So when we heard last night that the 24-year-old had penned a five-year contract extension, we were over the moon. Robbo is now signed to Liverpool until 2024, and the manner in which he’s settled into life on Merseyside, we think he’ll see it out. Jurgen Klopp’s description of the speed in which Robbo agreed terms shows how humble the Scot truly is. “I think of all the contract renewals I have been involved with, this one was done in almost record time,” Klopp told Liverpoolfc.com. “It’s fair to say Robbo didn’t hesitate for even a second when we spoke about extending his stay at our club for longer. “I remember when we signed him back in the summer of 2017, I spoke a lot about ‘his story, his journey’ and how much I loved it and thought it pointed to the type of person and player he would be for us. He has exceeded these expectations. Does that not make you love our left-back even more? Liverpool will likely be purchasing a new one this summer; not to replace him, but support him with the expected exit of Moreno on a free transfer. The Spaniard is so far below Robertson in terms of quality it’s crazy, so a more capable reserve option would bolster to squad – as an injury to the Scotland captain would be devastating.